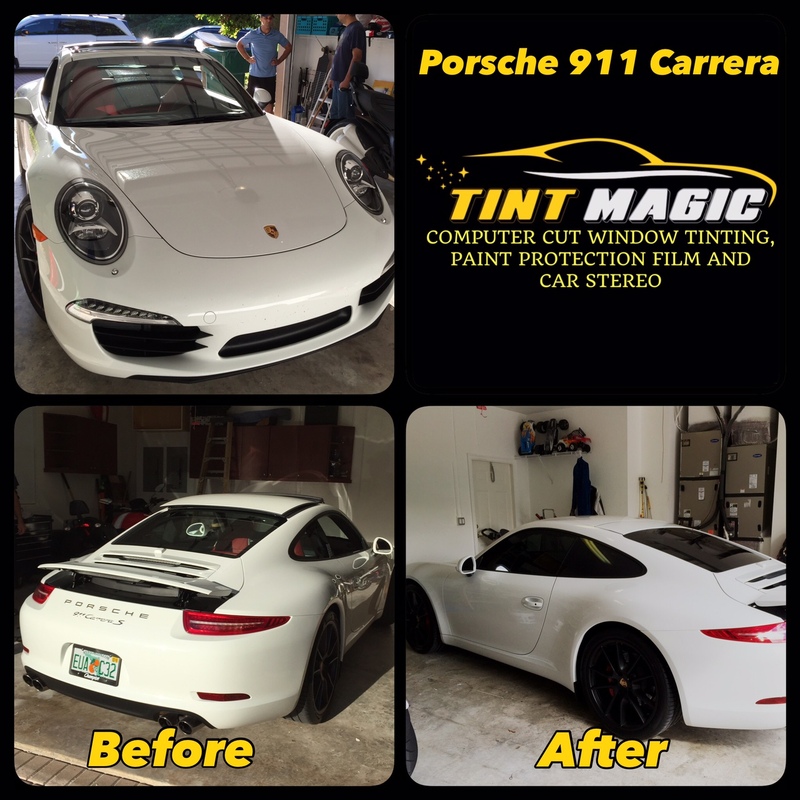 Porsche 911 Carrera at Tint Magic Window Tinting Coral Springs. We have applied CXP Nano Carbon 25% all over around for superior solar energy rejection and 99% UV protection. Call us for a free quote! (954) 840-7883. The big news out of Stuttgart for 2017 is that the 911 Carrera and Carrera S are now turbocharged. That’s right, turbos aren’t just for 911 Turbos anymore. Both the Carrera and Carrera S get two turbochargers hitched to a 3.0 liter flat six that is smaller in displacement than last year’s naturally aspirated engines. Buying a Porsche turbo is now easier but not easy: You’ll still have to get over the Carrera’s $90,395 point of entry. Turbocharged 911s have existed for 40 years, but putting a turbo in a regular 911 is met with suspicion among fans of the crisp response of Porsche’s naturally aspirated engines. “Turbos are for Turbos,” they’ll chant. Confusion will follow, chaos will reign. But Porsche has been battling turbo lag and working to smooth out the hit longer than just about anyone else. Perhaps that’s why the 3.0-liter twin-turbo engines in the new 911 Carrera and Carrera S are not only stronger than the larger, non-turbocharged engines they replace, but nearly as responsive. e turbochargers make a big difference in the base Carrera. Here, the turbocharged six makes 370 horsepower at 6500 rpm (20 more than before) and 331 lb-ft of torque (44 more) from 1700 to 5000 rpm. The turbo engine has midrange oomph that the previous 3.4-liter never had. That engine required big revs to provide meaningful thrust, producing just 243 lb-ft of torque at 3000 rpm compared with the 331 lb-ft that the turbo makes at the same engine speed. It’s a massive difference. The old engine didn’t wake up until the tach needle swung past 4000 rpm, and peak torque didn’t arrive until 5600 rpm. The turbochargers bring the power much earlier in the rev range, but at low rpm there is a brief spool up before the power arrives. It’s not a big delay, just a minor calm before the storm. The push comes quickly and it’s a much harder shove than delivered by the old naturally aspirated engines. In lower gears, the engine pulls easily from idle and makes strong boost by 2000 rpm. By 3000 rpm, it’s a mad dash to the redline, and there’s no detectable lag, just thrust. Lug it in sixth or seventh and the boost takes more time to arrive, but we don’t recall the naturally aspirated engines pulling with any gusto from low rpm in high gears.